Poaching the chicken in a stock made with KNORR Concentrated Liquid Stock and a little COLMAN'S Wholegrain Mustard, adds flavour and depth to this simple dish. Heat oil in a large pan over medium high heat. Add chicken thighs and brown well. Remove from pan. Add leeks to the same pan, cook until softened (do not colour), then add garlic and thyme. Combine COLMAN'S Wholegrain Mustard, KNORR Concentrated Liquid Stock, water and lemon juice. Add to pan, bring to the boil. Return the chicken to the pan along with zucchini. Simmer until the chicken is just cooked through. Add peas, cook for another couple of minutes. 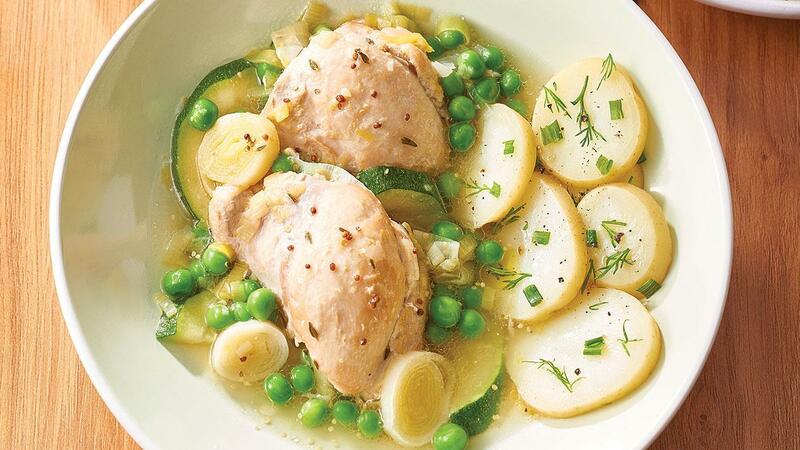 Serve with steamed baby potatoes, steamed vegetables or salad. Do not open out or flatten the chicken thigh fillets, keep them folded over in a compact shape for even cooking and presentation.